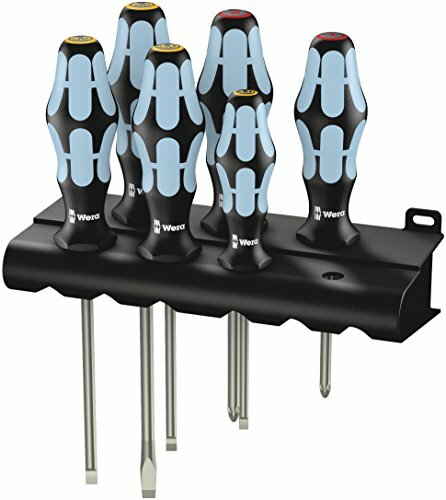 Wera 6 Piece Kraftform Stainless Screwdriver set is designed to keep rust at bay. Wera’s Stainless tool line is manufactured from 100% Stainless steel, preventing extraneous rust caused by use of conventional tools contaminating stainless fasteners. Wera’s unique vacuum ice-hardened process gives the necessary hardness for industrial applications. Lasertip micro-rough drive tip bites into the fastener to ensure a perfect fit and reduce cam-out effect. All Wera hand tools feature the trademarked ergonomic Kraftform handle that fits the shape to the hand for the ultimate in comfort and high-speed torque transfer. Handle marketing on top of handle include screw symbol and size of tip to easily find the right screwdriver in your toolbox or workplace. Anti-roll protection at base of handle stops screwdrivers from rolling away at workplace. Limited Life Time Warranty. Set contains 4 Slotted - 1/8” (no Lasertip), 5/32”, 7/32”, 1/4"; 2 Phillips - PH1, PH2. Includes wall-mounting rack for convenient storage and tool retrieval. Wera – The Best Tools For The Job!